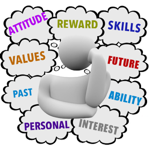 Australia's Careers OnLine > Job Seeker’s Workshop > Choosing a Career > Who Are You? You are a crazy mixture of past experiences, present feelings, and future hopes. YOUR PAST – WHAT HAS LIFE TAUGHT YOU ? The PRESENT- WHO ARE YOU ? YOUR FUTURE – WHERE DO YOU WANT TO GO ? And, on top of all that, you are also a collection of physical, emotional, intellectual and social characteristics!!! The more you understand yourself, the closer you are to self-acceptance, and of making decisions you will be happy with. Discovering who you are is a process which continues all your life. Reflecting on particular incidents can be very valuable to you to help discover these things. And you can also get help by talking to your friends and your family. Done properly, it points you in the direction you should be heading, rather than wandering around lost and bumping into dead ends. So…. Who Are You ? Because that is something a lot of people actually find really hard to do, and you need to know a LOT about yourself to have the best chance of getting the job you want! Take several pieces of paper and write your name at the top left-hand side of each page. On each page write one of the names from the list below at the top of each page. The, write down on each page, what you think each of these people think ABOUT YOU. Mother, father, brothers, sisters, girl/boy-friend. teacher/boss, a close friend, an enemy, your doctor, sporting coach or captain, a stranger you met at a party, your 6th class teacher, you in a good mood, you in a bad mood, your spouse (husband or wife) in 10 years time, your workmates in 10 years time. How your PAST EXPERIENCES might affect your career decision making.